The platform is attracting big names like Katy Perry, Kevin Hart and Ellen DeGeneres. Before YouTube could trot out the stars, it had to address the elephant in the room at its NewFronts presentation on Thursday—brand safety. YouTube CEO Susan Wojcicki ran on stage at the Javits Center in New York City wearing a bright purple dress, and started the show off with an apology. "You've told us to do better when it comes to ad placements," she said. "These past weeks have been hard for you. We apologize for letting some of you down. We can and will do better. Our team has been working around the clock." Earlier this month, YouTube started working with DoubleVerify and Integral Ad Science to work on viewability concerns. But not another word was said on the topic. Instead, YouTube announced a lineup of new shows coming to the platform this fall. The majority of the series won’t be hosted by original YouTube creators. Rather, they will feature big-name movie, TV and music stars including Kevin Hart, Katy Perry, Ellen DeGeneres, Ludacris and Demi Lovato. All shows will be ad-supported, with Johnson & Johnson the first major brand to sign on. "Best.Cover.Ever." will be a talent competition series produced by Ryan Seacrest and hosted by Grammy Award-winner Ludacris. Katy Perry will also be appearing in the new series. Artists from around the world will upload their submission videos to YouTube to vie for the prize of collaborating with a famous musician on a project. Ellen DeGeneres will star in "Ellen’s Show Me More Show," meant to give fans exclusive access to her favorite moments with celebrity guests. "I AM: Demi Lovato" will follow the Grammy nominated star as she puts the finishing touches on her upcoming album. Comedy star Kevin Hart will be the force behind "Kevin Hart: What the Fit?," a series following his attempts at mastering rigorous workout routines. Finally, Katy Perry will host a three hour livestream of a "listen along" to her upcoming album. Two of the new shows will revolve around YouTube stars. "Good Mythical Morning" will feature Rhett and Link, a pair who has 4.3 million subscribers on YouTube, and their interviews with stars. "The Super Slow Show" will focus on things in slow motion with YouTube’s The Slow Mo Guys, who have more than nine million subscribers. Like previous Brandcasts, Thursday's presentation was a star-studded evening. James Corden, whose "The Late Late Show with James Corden" has 10.2 million subscribers and has brought in 2.8 billion views, told the roomfull of advertisers that YouTube played a "massive part" in the growth of his show and applauded the platform for bringing communities together. "YouTube has changed everything, the way we share things, the connections we share with people," he said. "Who we watch and when we watch them." He also made sure to slip in a few of his signature jokes: "Before YouTube, going viral meant it burnt when you peed," he said. Casey Nastiat, with his 7.1 million subscribers, and Jackie Aina, with her 1.3 million subscribers, were also present at YouTube’s NewFront and spoke about how they made their starts on the platform. 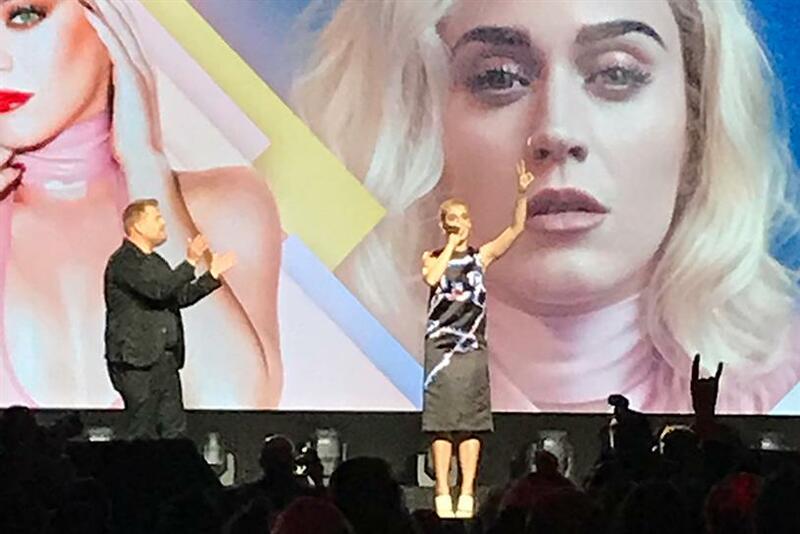 After the presentation, Katy Perry performed some of her hits. Despite issues of brand safety, which has become a common theme at the NewFronts this year, YouTube has had an impressive year, especially when it comes to TV. Wojicicki announced that viewing time for TV channels on YouTube has grown 50 percent in the past year. Still, Wojicicki said "YouTube is not TV. And we never will be. The platform that you all helped create represents something bigger. Together with our creators, you built one of the most dynamic, creative and inspiring communities in history: millions of voices, creating hundreds of millions of videos, all being watched by over a billion people." Surprisingly, there were no announcements about YouTube TV, the platform’s new live TV offering. YouTube also described the growth of its Google Preferred offering, which is now available in 20 countries, and its six-second bumper ads. Over seven in 10 Google Preferred campaigns drove purchase intent and nine in 10 drove brand awareness in the past year, said Wojicicki. Meanwhile, nine out of ten six-seconds ads on the platform drove a lift in ad recall.